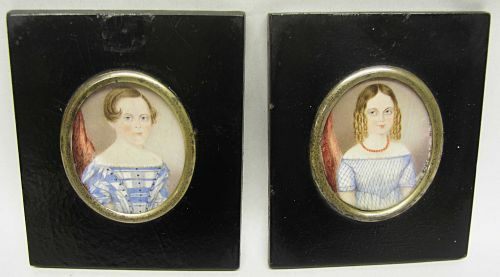 Pair of Miniature oval portraits on ivory believed to be a brother and sister. Wonderful bright colors with Blue dresses and Blue eyes. Mounted in brass oval frames inserted in black laquered frames. Great condition with only very slight cupping to portraits. Dimensions: Frames measure 3 3/4" X 4 3/8" and oval section measures 1/3/4" X 2 1/2"